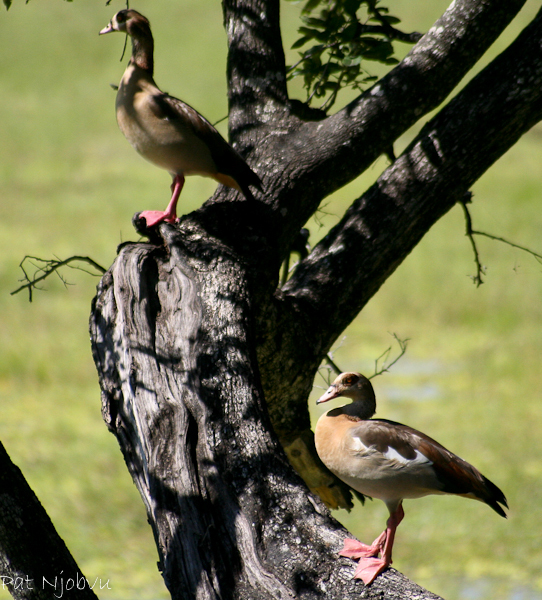 Our 2012 season is now in full swing, with almost one hundred visitors since we opened camp on May 26th. 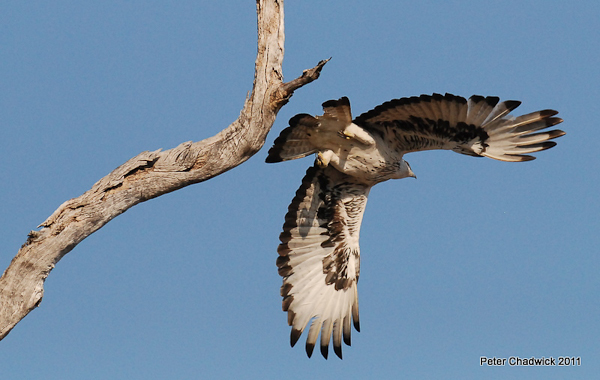 It’s been a fantastic start to the season, with fabulous sightings. The late rains from April certainly made a difference for the vegetation, and the availability of water inland. Trees are still quite green, and the grass high, which makes finding wildlife, especially felines, that much harder for our guides. But they are persistent! And well rewarded. Patrick was the first one to come across our first cubs of the season – 5 of them! 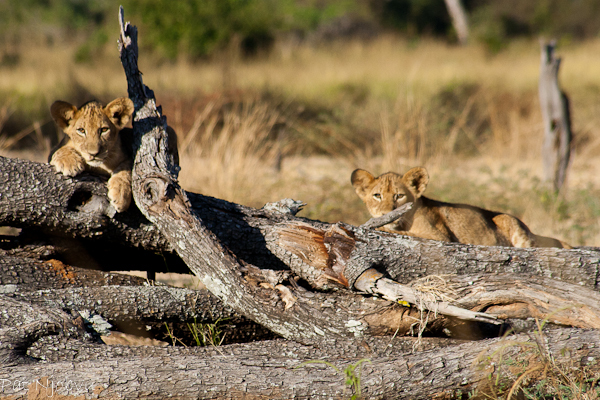 They were found playing on a dead log, with no mothers or aunties in sight. We were able to bring all our guests to see them that same evening, and we have seen them several times since, although they are moving a lot and covering quite a distance. 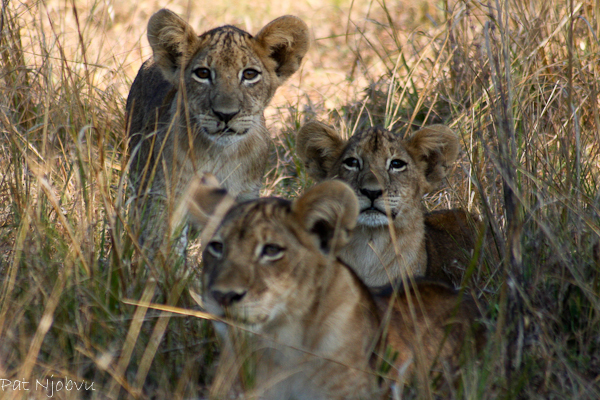 We did find them another time with the lionesses, which allowed us to identify them as being part of the Mwamba pride. 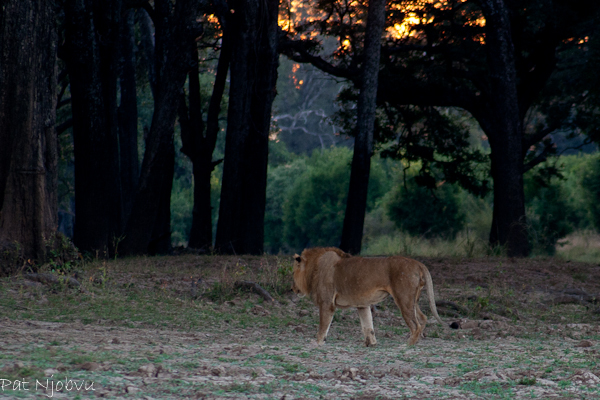 Mating lions of the Mwamba pride were also observed for several days. The Hollywood pride has been much more elusive, and we have sighted the males (MGM for those of you who are familiar with this coalition of 3 beautiful males) only a few times so far. They are also covering quite some territory, as they have been reported on the other side of the river, on the Nsefu Sector, as far south as Tena Tena. We’ve had also new males encroaching in our area, which will be interesting when the Hollywood males come back and patrol this part of their territory. Only time will tell. Leopards have not been as shy as their bigger cousins, and have spoiled us with many appearances. 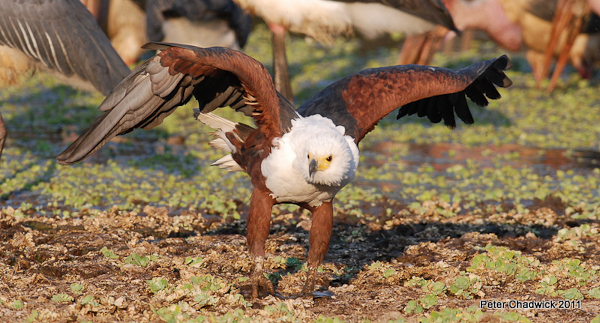 They are unpredictable however, and while some are shy and skittish, others allowed for lengthy observation. 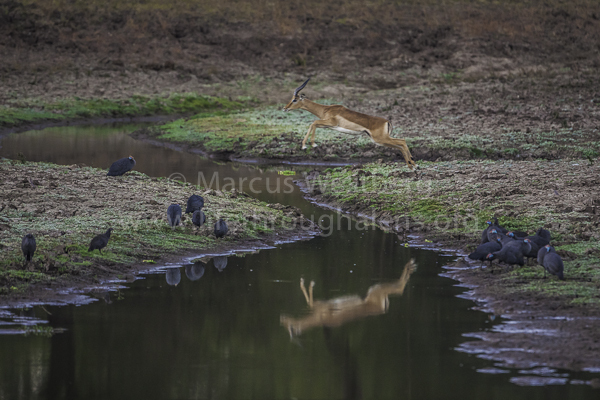 I was lucky enough one evening to see a young female trying her luck on a herd of impalas, but it was easy to see that she still had a few tricks to learn! On another morning, our guide Sylvester found not one but two leopards eating on the same kill, perched high in an ebony tree, while hungry drooling hyenas were lurking around, waiting for scraps. Hyenas have certainly chosen Kaingo as their base this year! There are so many of them around, almost daily sightings on morning and evening drives, and certainly present in camp on a daily basis. To our great dismay… our beautifully handcrafted leather sighting book was found in shreds a few meters away from the Chitenge one morning, and pots and pans left unattended are now bearing marks of very sharp teeth! 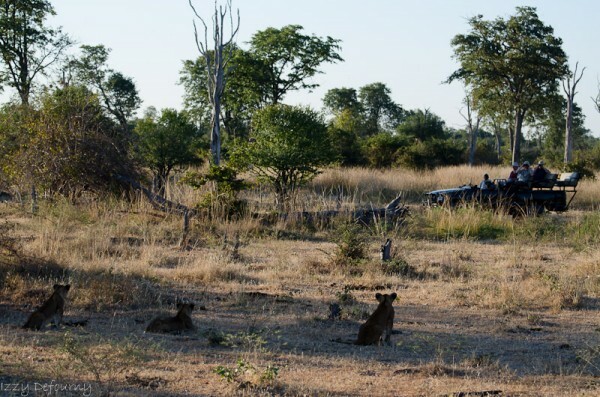 Lions are not fans of hyenas, and on a morning drive Patrick found a dead hyena which had obviously ventured too close to those lion cubs, and their mums. 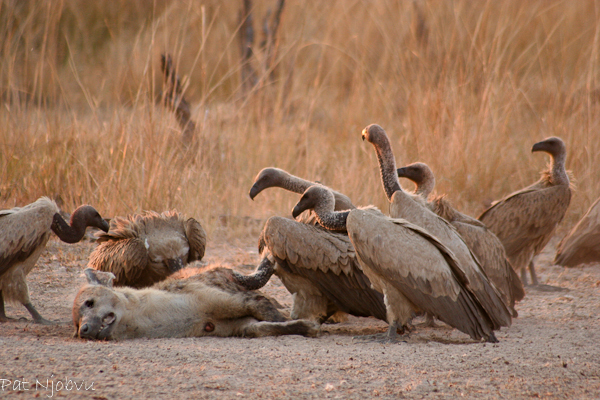 The lionesses didn’t give that hyena a chance, and instead provided a cheap meal to the vultures. Meyam on the other hand has been lucky with a wild dog sighting, on one of his walks. 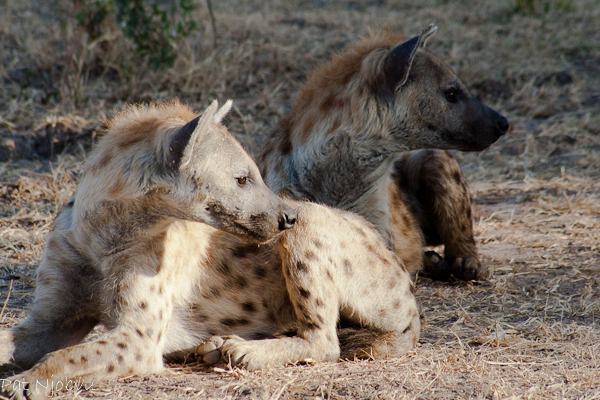 That same wild dog had been seen last year too, and it is good to see that although alone, it seems to be doing well. It was sighted a second time since. 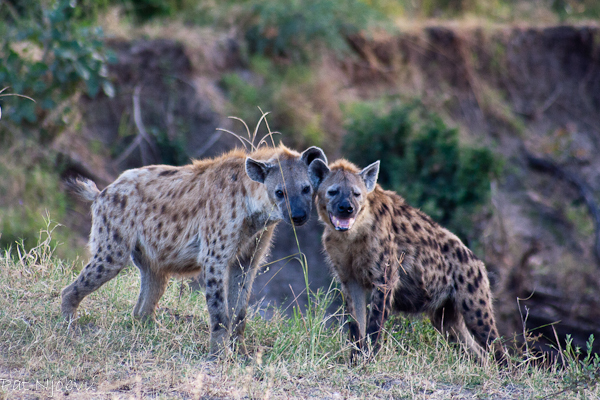 There have been reports of wild dogs denning near the Mfuwe gate, and we have had sightings of those on transfers passing through that area. But so far the palm goes to Sylvester who came across an aardvark foraging in the bushes. Sylvester and his 3 incredibly lucky guests were able to observe the nocturnal anteater for a few minutes although no usable picture came out of the encounter! When we add the huge herds of buffalos that have already been seen, as well as lots of elands, wildebeest and the general plains game, it really has been a good start. Jules, Saphire and Jayabella, are here at Kaingo for an extended visit, and Derek is so delighted to have all of his girls back in camp. We’ll try to catch some good family portraits to share with you on our next newsletter. In our last one we published the first half of the interview Derek and Jules participated in for one of our agents, discussing their experience as camp owners, parents, conservationists and photographers. You will find below the second part of the interview, with Jules’ story and tips. At the end of May we had the honor of hosting Marcus and Kate Westberg, professional writers and photographers, currently travelling throughout southern Africa, writing on issues related to travel, conservation and development and working on assignment for National Geographic, as well as travel blogs for Africa Geographic. Marcus and Kate also spent time with Karen and Dave from Project Luangwa, as they were particularly interested in writing about tourism ventures that incorporate conservation efforts or benefit local communities. We are looking forward to reading their story, and in the meantime Marcus has given us a sneak preview to a couple of his pictures. We are also excited to currently host a professional video-photographer from South Africa. He specializes in “virtual” 360 degrees videos of safari lodges and hotels, and you will soon be able to admire his work on our own website with brand new videos of Kaingo and Mwamba. As you all know we proud ourselves in paying particular attention to our guests who are keen photographers. All our guides are trained to that effect, and they understand the needs and expectations of photographers. So much so that some of them have developed a real interest themselves in photography. Patrick, our senior guide, is one of them, and at the end of 2011 he received his first DSLR camera, generously donated to him by previous guest Judy Scotchford. Patrick has been able to put in practice what he’s learned from his guests over many years, and you can see for yourself that he is pretty good at it too! Well done Pat! You can see two of his pictures above, and a lot more just here. however Proflight sent a new statement out to announce they were adapting their policy again. 2 pieces permitted not exceeding 15kgs – so now it is 2 pieces instead of 1, BUT total weight remains at 15kgs. The hand baggage is still limited to 5kg, but is no longer restricted to 1 piece. Remember Excess and Additional Bags are carried on a standby basis and subject to capacity. The only solution to guarantee the carriage of excess luggage (to travel with the passenger) is to buy an extra seat on the flight. On another note, you might have heard about a new regulation issued by the Zambian Government regarding the use of the Kwacha versus foreign currency, within Zambia. Effective since late May, any domestic transaction should be settled in Zambian Kwacha, and not in USD. There is still a lot of speculations about these rules and their implementations, and many organizations have appealed against the bill – such as the Zambian Tourism Board, various Safaris Associations, and airlines, so we are waiting for further developments and clarifications. Like so many other countries around the world it will now be necessary to conduct all business within Zambia using our local currency, the Zambian Kwacha. Assuming these new regulations are restricted to domestic transactions they should have very little impact on tourists visiting our country as local currency is available from all cash-point (ATM) machines as well as from banks and foreign exchange bureaus. Visitors are therefore invited to buy Kwacha upon arrival in Zambia, or retrieve some at the ATM to cover small expenses such as airport taxes, or extras not included in their travel packages. We of course remain at your disposal for further information, as we are also waiting for clarifications ourselves. To end this newsletter on a lighter note, we are delighted to feature the winning photographs for our June Picture of the Month competition. The theme was Birds of Prey. 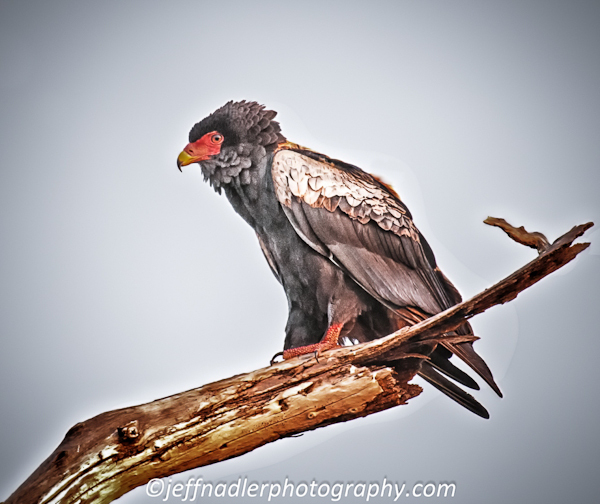 Congratulations to Jeff Nadler and Peter Chadwick for their stunning images. Our next themes will be “Hoofed” for August and then we will be back in our “Miscellaneous” theme for September, after a 12 month cycle. I look forward to receiving more pictures from all our previous guests. Remember, they must have been taken while on safari at Kaingo and/or Mwamba to be entered in the pool. That is it for me for now. We’ll catch up again later in July! 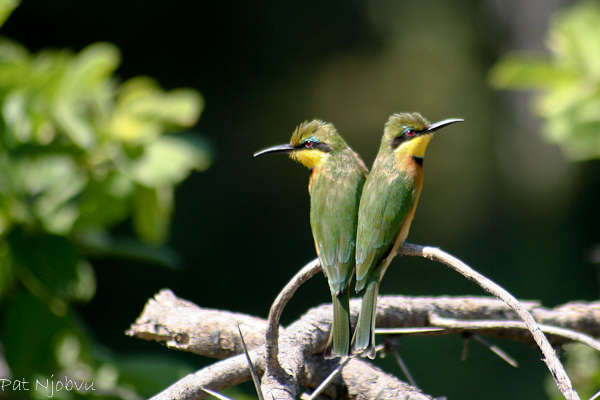 JULES SHENTON – Owner of Shenton Safaris, zoologist and wildlife photographer. 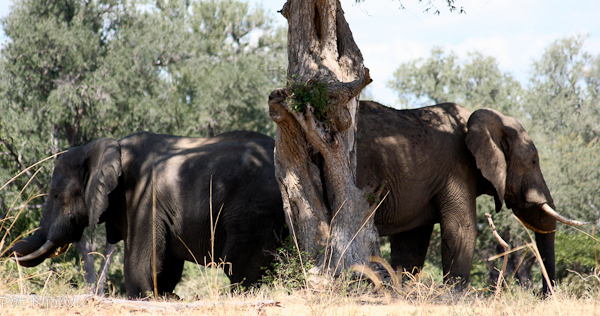 How did you come to discover South Luangwa and Derek’s camps? It was the world’s longest distance blind date! Parko, one of my fellow Zoologist university buddies, had been guiding in the South Luangwa for 10 years and had been trying to get me to visit for years. I was living and working in London at the time and had decided to make a change. Parko convinced me to come and work a season in the valley and arranged me a job with Derek, who happened to be one of his best friends. Unbeknownst to me it was a set up from the beginning with Parko playing cupid. He laid bets we’d be married before the year was out – as it turned out we were married within 18 months. It’s nearly 10 years down the line and we’re happily married with two little girls. Were you a passionate photographer before that? I did a course in photography at school and had always enjoyed taking photos, but I wasn’t particularly serious about it. Wildlife photography is a game of opportunity. There is no greater opportunity than living smack bang in the middle of the most game-dense area of one of Africa’s premiere safari parks. I got hooked in my first season using an old Digital camera of Derek’s and bought serious equipment before my second season. 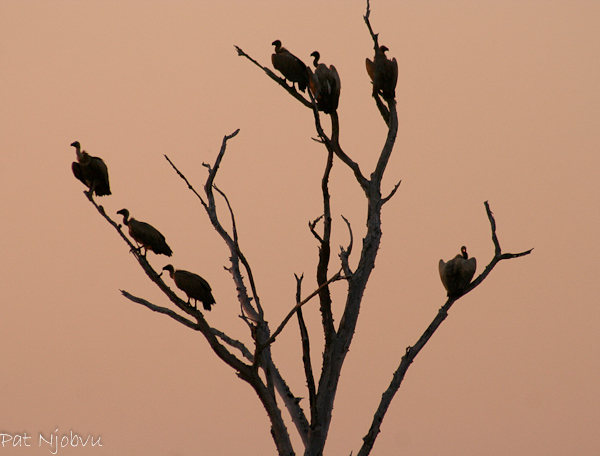 What makes South Luangwa a destination of choice for keen photographers? I think first and foremost it has to be the stunning game density and the prevalence of leopard and lion. 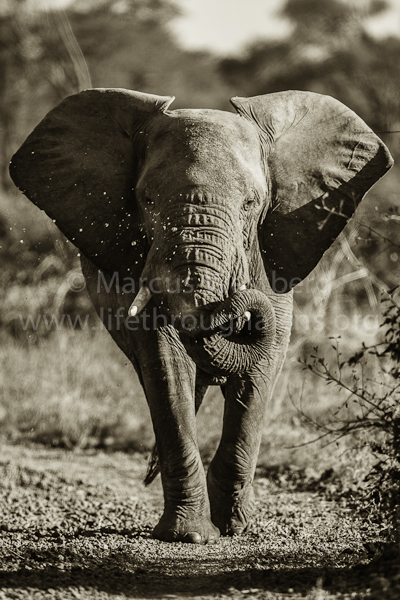 Whilst a safari is definitely about much more than the ‘big cats’ they do make fairly compelling photographs. Beyond that at Shenton Safaris we have several purpose built hides that will get you closer to the action than any other safari experience. The hides can also make for better pics as aside from the incredible proximity the wildlife often are not aware you’re there so you can witness and photograph more natural behaviour. 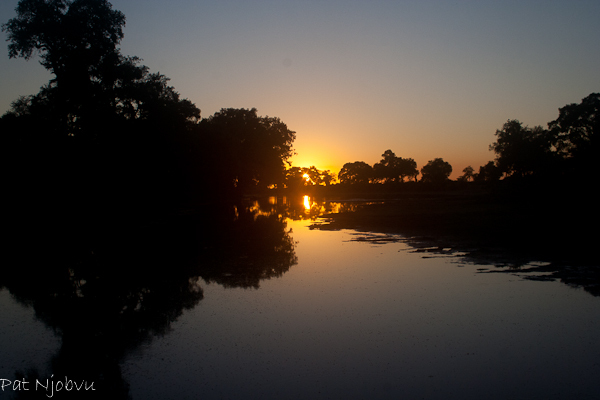 The South Luangwa also has magical light – in the earlier season it’s green, clean and pretty – later in the year it’s dusty, evocative and moody. I remember in my first season a veteran guide said to me he could instantly recognise the Luangwa in wildlife documentaries purely by the quality of the light – a statement I thought was fairly incredible at the time, but now I know exactly what he means. 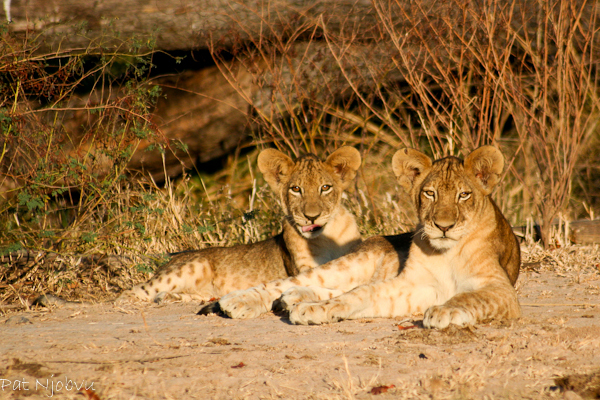 What are the 5 pieces of equipment you recommend bringing on a photographic safari? It’s tricky to just restrict it to 5 so let’s eliminate the obvious flash disks and a backup storage solution. I would take 2 bodies, and 2 lenses – changing lenses in the field is a no no – it’s bad for your camera, you waste time and miss shots. Lenses you need a good mid range option (I use a 70-200 IS f2.8 with a 1.4 x extender) and a good long range option. When considering your long range option consider bulk of lens. An f2.8 300 or 400mml when combined with a 1.4 x extender is perfect; you can hand hold it, it’s readily maneuverable, you can switch bodies easily, and it will lay on the seat next to you. It’s also much easier to carry your gear as hand luggage on the plane, because you do not want to be checking camera gear into the hold. The fifth and final item I recommend came to me from the famous wildlife photographer Andy Rouse – and it’s an angle finder. It’s a little contraption that fits onto your eyecup and lets you lower your camera off the side of the vehicle getting a much lower angle – making the viewer seem like they are at eye level with the beast rather than the standard view of up looking down. 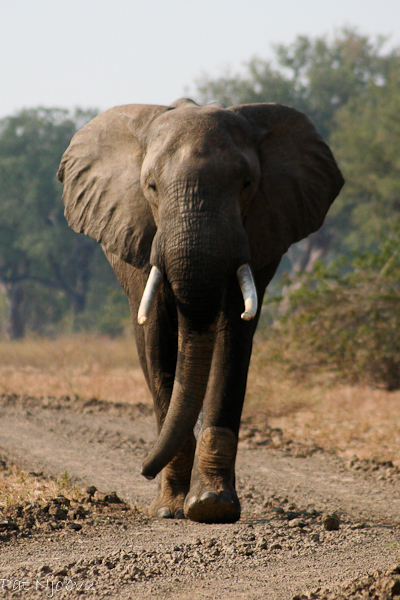 If you manage to get really low looking up at an elephant for example it creates a very attractive composition. Consider renting your gear. If you’re new to your photographic journey or you just don’t have the daily use for a big lens look into renting them. There are some really cost effective rental options. What is your biggest tip to photograph leopard? 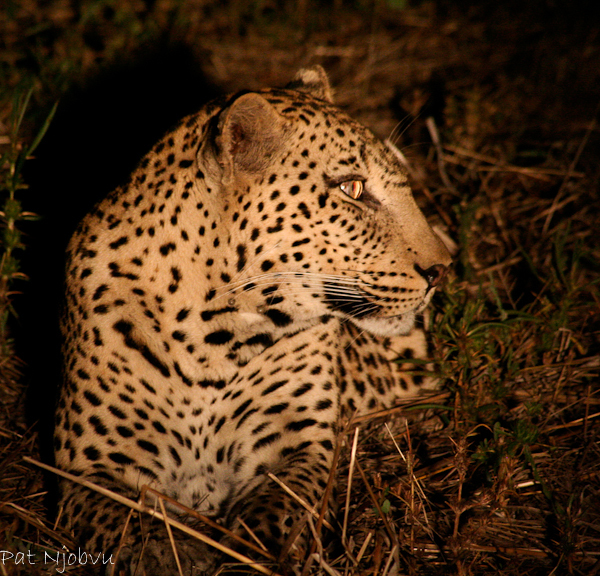 Photographing leopard is all about luck or patience. I have had tons of lucky leopard encounters and captured magical photos, but once you’ve found the leopard it’s all about patience and staying with them. This is not always easy in a mixed group on a vehicle as some guests will become bored and want to move on. If you’ve been on several safaris, you have the budget and you really want to photograph leopard then pay for a private vehicle and once you’ve found your leopard stay with it! I’ve sat for hours and hours in the hot sun under a leopard, busting for a loo break whilst the cat happily snoozes above us mostly hidden in the leaves. Sometimes that has paid off and sometimes it hasn’t and the cat has continued to snooze beyond our endurance. When it comes down to it chance is your best ally and we have always found that guests who are appreciative of everything nature throws their way tend to have the best luck. What are your favourite camera settings? Be shooting ready at ALL times! When moving around in the field I always have my camera set to the highest motor drive, with the aperture wide open and the AF on servo (the mode that refocuses on moving objects). If you come upon something beautiful that is standing still you will have time to change your settings and compose your shot, but if you come across a lion pride trying to pull down a buffalo you’ll be ready to capture the moments the second your brain registers what’s going on in front of you. Wildlife photography becomes so instinctive you’ll likely have your camera up and shooting before your brain has quite registered what is in front of you! The only other thing I routinely do with my camera settings is change the ISO and white balance as I’m moving around through the drive (or walk) as the light changes, even if there is nothing going on in front of me to shoot, that way when there is, I’m ready for it. Why do you think Shenton Safaris became so renown for photographers? Derek had been developing hides and unique photographic opportunities for 15 years by the time I came along, he just wasn’t great at talking about it. So we were discovered first by the professional photographic and filmmaking community and word spread from there. Finally what is your secret secret for successful wildlife photography? For me that’s simple, it’s our area and our photographic hides. As I’ve said before wildlife photography is all about opportunity and I am spoilt enough to have it in abundance. If you’re really about the photography (rather than experiencing different areas and camps) then do your research and choose your location carefully. Game density and access are the most important factors. Once you’ve chosen your location stay in it for the longest period you can. Every location will have the odd couple of quiet days and you don’t want to follow a losing streak around. There is nothing more annoying than hearing “You should have been here last night…”. Hang around long enough for the hot streak to return. The majority of our photographic guests spend 8-10 days with us split between our two camps which make the most of our area. Settings. Nikon D300, 1/250sec at f/8.0. Focal 550mm. ISO 3200. Settings: Nikon D80, 1/500 sec at f/6.3. Focal 420 mm. ISO 400. 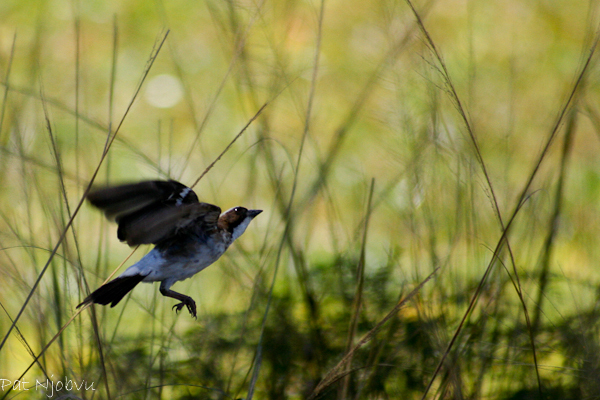 Settings: Nikon D80, 1/4000 sec at f/5.6. Focal 300 mm. ISO 800. “Having been coerced into my first trip to Africa by my wife 15 years ago I have developed my own passion for the continent and with that a love of wildlife and photography. From that first African experience and subsequent trips to Tanzania, Zambia, India, Sri Lanka and my native outback Australia I have learnt that wildlife comes in many shapes and forms from migrating Flamingos and desert foxes in Kuwait, where I currently reside, to the majestic Bengal Tigers of India and stunning Asian Leopards and Sloth Bears of Yala National Park in Sri Lanka.